Keywords: Diagnosis, DNA expansion, Neurological disease, Therapy, TNRs-acting ligands, Trinucleotide repeats. Affiliation:Institute of Genomics and Bioinformatics, National Chung Hsing University, Taichung 40227, Taiwan. Keywords:Diagnosis, DNA expansion, Neurological disease, Therapy, TNRs-acting ligands, Trinucleotide repeats. Abstract:Expansion of trinucleotide repeats (TNRs) within genes plays a major role in pathology of various neurological diseases. The correlations of these unusual repetitive sequences with the aetiology of these diseases and the mechanism by which those repeats are expanded during replication have been extensively studied. Small-molecule ligands that bind to TNRs could provide potent biological applications. First, the length of the TNR is the most important determinant of these neurological diseases. Ligands that reduce the repeat length or impair repeat expansion may be used to delay onset and reduce the severity of these diseases. Interestingly, many important anticancer ligands and antibiotics have desirable qualities when interacting with TNR DNA, and may form the basis for the development of novel therapeutics against neurological diseases. 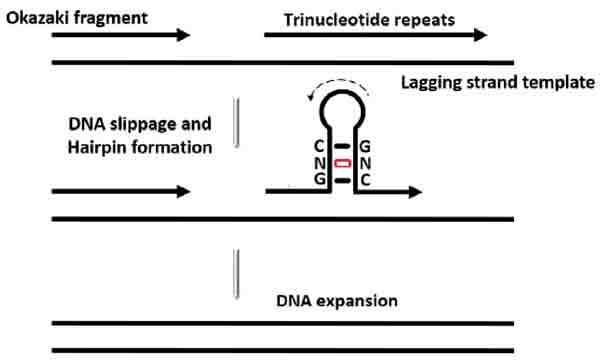 Second, designed ligands that bind to expanded TNRs with high specificity based on the structural and chemical characteristics of these repeats can serve as diagnostic tools for determining repeat length and may have applications in preventive medicine. In this article we will review our current understanding of the interaction between DNA-binding ligands and TNRs.